Porto glass wall washer wall light. A simple bowl shaped wall washer that can be used in a variety of situations around the home. It is neutral in colour and will not clash with other colours in a room. Wall washers cast a warm pool of light onto the wall above the light fitting whilst still letting some light out through the shade. Useful for lighting corridors as well as sitting rooms and dining rooms. These type of wall lights provide a background light which can be supplemented by other brighter lights as and when needed. 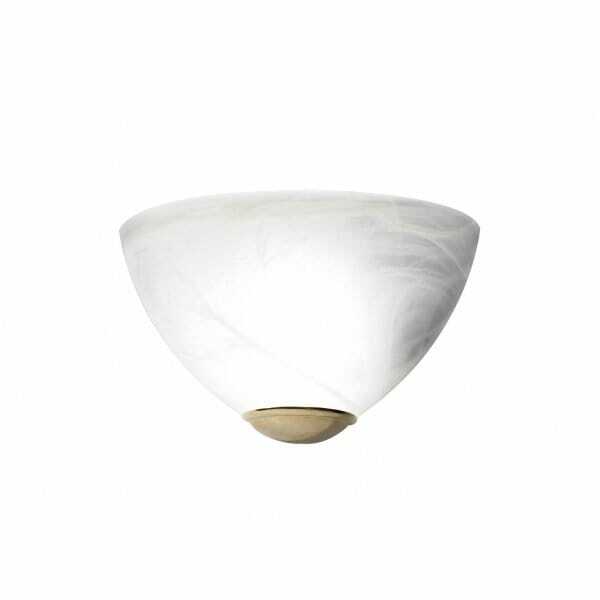 This wall light consists of a bowl shaped alabaster glass shade which has a slight marbled effect. It is supplied with both a polished brass trim (as shown in our picture) and a satin chrome trim which can be selected depending on the room setting. The wall light can accommodate either a standard or a low energy bulb which is hidden inside the glass shade.